Smartphone Fanatics: iOS 4.2 Still "Coming Soon"
Did a last minute Wi-Fi bug end up aborting yesterday's rumored launch for Apple's iOS 4.2 update for the iPhone, iPod touch, and iPad? There certainly seems to be enough evidence of that. Apple had released the golden master, or "GM" developer release of iOS 4.2 a few days ago. The GM release of software is usually identical to the shipping version. Many speculated that this past Friday, 11/12/10, was suppose to be the launch date for iOS 4.2. November 24, 2010 is the new rumored launch date for iOS 4.2. Rather than getting a final software release of iOS 4.2 yesterday, we saw Apple release a second GM release of the software. The release of a second GM version of the software leads me to believe that the reports of a late discovered bug was to blame for the iOS no-show. Software usually goes through several iterations before getting int consumer's hands. Alpha, beta, release candidate, golden master, and then release/retail. It's normal to see several release candidates, or RCs, but you usually only get one GM. The way I see it, during the September iPod event, Apple CEO Steve Jobs promised that iOS 4.2 would be available in November, and there is still plenty of time to make good on that promise. I'd rather have working software than almost working software. That said, I still want access to the cool features that iPhone 4 and late generation iPod touch users have had for the last few months already. In the mean time, if you haven't already done so, you can upgrade to Mac OS X 10.6.5 and iTunes 10.1 (iTunes 10.1 is available now for both Mac OS X and Windows PC). 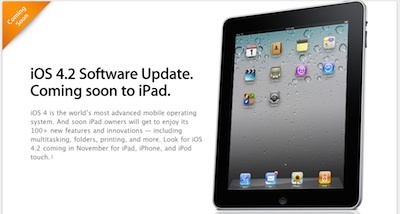 Both software updates lay the ground work to support iOS 4.2 devices. Use the Apple Software Update control panel to upgrade your Mac OS X or Windows PC.